All parents with teens starting driver education have mixed feelings of excitement accompanied with nervousness. If your child has ADHD or another executive functioning disorder, you likely have even more concerns than other parents. Just how nervous should you be? How do you negotiate your child’s desire to drive with the challenges they face? What resources are available to you? At Top Driver, we are prepared to help you with all of these questions and more to make sure that your teens with ADHD or another executive function disorder is a prepared and safe driver. Every parent wants their child to be a successful and independent young adult and driving often represents one of the first steps in this direction for many American families. Naturally, having a teen driver can be a good thing for a family: a teen driver may be able to help out with errands or carting around younger siblings, taking some of the burden off their parents. Teens represent about 14% of the U.S. population but they account for 30% of the total costs of motor vehicle injuries. Six teens, ages 16 to 19, die every day from motor vehicle injuries. Teen drivers ages 16 to 19 are nearly three times more likely than drivers aged 20 and older to be involved in a fatal crash. And the worst statistic of all? Motor vehicle crashes are the leading cause of teen death in the United States. These facts alone leave many parents dreading their teen’s sixteenth birthday. But for teens with ADHD, driving is even more dangerous. A 2007 study revealed that teens with ADHD are two to four times more likely to be involved in motor vehicle crashes than their peers without ADHD. This means that teens with ADHD are actually more likely to have a car crash than an adult who is legally drunk. While no one would let their 40 year old friend drive while intoxicated, many parents feel obligated to allow their teens – even those with challenges like ADHD – to get behind the wheel. While these statistics are shocking, they may not be particularly surprising to parents of teens with ADHD. Distracted driving is the number one cause of car crashes among all drivers and most parents of teens with ADHD know just how distractible their teens are. Furthermore, ADHD often causes teens to be more impulsive than their peers. Driving is, in fact, quite a complex task and it requires the very skills that are most affected by ADHD and other executive functioning disorders: planning ahead, following through, and staying on task. Being distracted by roadside signage. Thoughts drifting elsewhere while sitting at a red light. Talking to others in the car. Incoming texts and phone calls. The result? Teens with ADHD are significantly more likely to get speeding tickets, to miss stop signs, to follow other cars to closely, and to ignore road markings. They are also more likely than teens without ADHD to drive recklessly and to drive while intoxicated. Given these facts, it’s easy to see why the rate of car crashes among teen drivers with ADHD is so high. While the statistics may seem daunting, you and your teen with ADHD don’t need to give up on driving altogether. In fact, as awareness of the issue of teens with ADHD driving has grown, so has the availability of resources for teens with ADHD that can help them to be better and safer drivers. Experts agree that helping teens with ADHD to become better drivers requires a multi-faceted approach that includes medication (as deemed appropriate by parents), negotiation, and preparation. If your child has been prescribed medication to help them treat their ADHD symptoms, there are a few important things to consider. * Research has shown that long-acting forms of medication help teen drivers with ADHD more than short-acting medications do. This is primarily because long-acting medications provide more consistent effects, and they improve focus for longer periods of time. These long-acting forms are usually taken once a day, which means parents can assure that teens have taken their medication at home, rather than relying on the teen to remember to take a short-acting pill as the school day ends and the teen prepares to drive. And, long-acting medications mean that teens are less likely to be caught between doses while driving. Be aware, however, that some long-acting medications only last 6 to 8 hours so a morning dose may be wearing off just about the time your teen gets out of school: one of the most likely times for teenagers to get into car crashes are the hours immediately after school, from 3pm to 6pm so assuring that your teen’s medication covers those hours is imperative for safe driving. From when they start driving to how much they are allowed to drive, there are a number of aspects of learning to drive that parents can discuss with their teens, doctors, and driving instructors, and come to agreements on in order to facilitate the teen’s learning and safety while driving. When to start teaching teens with ADHD about driving. Some experts think that beginning to teach teens with ADHD to drive at earlier ages – some recommend as early as 14 – provides the most benefit. This extra time allows parents to have control over the teen’s learning and driving longer than if driving education is started closer to age 18. While most states do not allow teens to drive before age 15, even if accompanied by a parent, parents can create plans to incentivize future practice driving time, have teens “narrate” while a parent drives to create awareness of driving challenges, or, if they have private land, allow teens with ADHD short periods of parent-supervised driving time. When to allow teens with ADHD to begin supervised driving. Many experts argue that almost any reason to delay teen driving is a good reason because maturity can be a key component of safe driving. As most parents of teens with ADHD are aware, maturity is often delayed in their children. Behavioral problems, consistently poor judgment, and limited independence may all be signs that your ADHD teen is not ready to get behind the wheel. Even noting how responsible your teen is about taking ADHD medication can be a sign of whether or not they are ready to drive. As teens with ADHD age, they are more likely to regularly take their medication, and that in itself can dramatically improve their chances of safe driving. Furthermore, the commencement of supervised driving should always be predicated by an eye exam and doctor’s visit, to assure that there are no hidden issues that might impair the teen’s driving. When to allow teens to get their license and drive on their own. Almost every state has its own laws about what a teen needs to do before obtaining their license. Some states require only a certain amount of supervised road practice; others have graduated programs in place. Graduated programs often restrict new drivers to driving only during daylight hours, limit the number of non-adult passengers in the car, and have stricter laws about cell phone usage for teen drivers. Whether or not your state has graduated licensing requirements, parents of teens with ADHD should seriously consider imposing their own set of graduated requirements. Parents with teens with ADHD may insist that their children drive only to school or work, may not drive with other teens in the car, and are not allowed to have music players (like iPods) in the car with them. Parents might also set up a logbook for teens to record medications, to sign cars in and out, and to list who they are going out with and where they are going. In all cases, these requirements can be gradually relaxed over time as teens demonstrate their ability to drive safely and responsibly. The key to success with these measures is two-fold: firstly, discuss the expectations and timelines openly and honestly with your teen before implementing. Writing out the expectations and posting them in the garage or another visible area in the home can also help teens with ADHD to keep on track with their safe driving. Secondly, consequences for not adhering to the expectations must be clearly set and implemented when necessary. What are the consequences if a teen is involved in an accident or gets a ticket? Think of all the likely situations and decide exactly how much extra time at a certain stage will be required or which privileges will be taken away – and make sure your teen knows and understands these consequences. 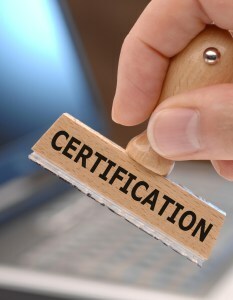 Most states require that students complete a state-approved driver education course. In some cases, your teen’s high school may offer this course or you may opt for a private driver education school. These courses generally contain an in-class portion, which focuses on teaching students the rules of the road. Additionally, instructors give practice written tests, based on the test that your teen will eventually need to take in order to get their license. Outside of the classroom, driver education programs also generally include supervised on-road training for your teen and some provide simulation driving experiences. Your state likely has a minimum number of supervised hours of driving that the school must offer. Many schools now offer different packages, starting with the minimum requirements, and adding supervised driving hours to more expensive packages. Parents of teens with ADHD should strongly consider programs that offer the most supervised driving time possible. But these programs often fall short in offering specialized programs for teens with ADHD, other than offering them more practice driving time. While practice driving time is hugely important to teens with ADHD, there are other challenges that students with ADHD face that most driving schools do not address. Classwork itself can be a substantial challenge for teens with ADHD, and so can test taking – all components of most driver education courses. That’s where Top Driver and Behind the Wheel with ADHD come in. Behind the Wheel with ADHD is the brainchild of ADHD and Executive Functioning Coaches Gayle Sweeney and Ann Shanahan. Sweeney and Shanahan realized that teens with ADHD required special treatment when it came to learning to drive. In response to this need, the coaches developed Behind the Wheel with ADHD. The program allows professional driving instructors to learn about the challenges that their student drivers with ADHD face and how to help students overcome these challenges. Top Driver has collaborated with Behind the Wheel with ADHD to create a specialized driver education program for teens with ADHD and other executive functioning disorders. Top Driver’s Specialized Driver Education Program for Students with ADHD and Other Executive Functioning Disorders is a multi-faceted learning system that incorporates much of the experts’ recommendations for teaching teen drivers with ADHD, and it also adjusts the format and delivery of educational materials to suit the special challenges these teens face. For instance, Top Driver’s Specialized Driver Education Program for Students with ADHD and Other Executive Functioning Disorders includes an individualized graduated driver’s license plan meeting that is held with instructors, the teen driver, and parents. Instructors are intimately familiar with your state’s laws concerning graduated driving licenses and they have also been trained in the graduated licensing techniques that work best for teens with ADHD. At Top Driver, we recognize that placing limits on your teen’s ability to drive might be a sticky subject, fraught with contention. We are ready to help you have that conversation with your teen and to help you lay out a program of expectations that works for your family. Furthermore, our program provides for private exam appointments to help students remain focused during written exams, a specially designed Student Workbook for maximized learning, and an individualized practice guide that students can use with their parents to enhance their driver education. Furthermore, we assure that your student has successfully passed their classroom training before they begin in-vehicle training. But one of the most important parts of our program for teen drivers with ADHD and other executive functioning disorders is that we provide instructors that are trained to teach your special teen. Your student driver will complete our specially designed 18-hour Behind-the-Wheel Curriculum and they will be trained by instructors who have been certified by Behind the Wheel with ADHD. This unique Top Driver program offers teens with ADHD and other executive functioning disorders the best chance for driving success and gives parents the tools and confidence to help their teens earn driving independence. Parents are the number one factor in assuring that their teens with ADHD and other executive functioning disorders become safe and responsible drivers. But Top Driver is proud to be able to offer our specialized program to assist both parents and teens in this journey. While Top Driver’s program with Behind the Wheel with ADHD is currently only available at our Illinois locations, we hope to expand and be able to offer this important training at our locations in other states soon. We encourage you to read the information about the Top Driver Program for Students with ADHD and Other Executive Functioning Disorders on our website. Furthermore, please feel free to call your local Top Driver location our Customer Service Center with any questions you may have. Your student’s education and safety is our top priority and we look forward to partnering with you as your child takes their first steps in their journey toward driving. 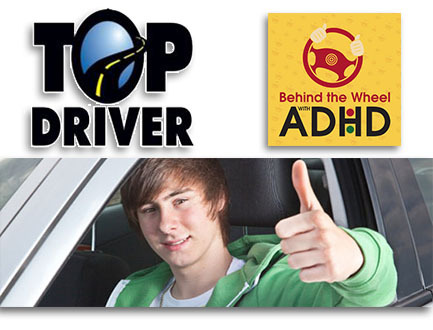 Please visit Top Driver’s website for more information on their Behind the Wheel with ADHD program. * Parents should always seek the advice of their child’s doctor when considering whether or not to medicate their child and in what form and dosage the medication should be delivered. This entry was posted in Top Driver Blog and tagged adderall, ADHD, ADHD treatment, Bad Driving Habits, Car Safety, Driver Education, Driver School, Driving, Driving Classes, Driving Practice, Driving School, Driving Tips, Driving with ADHD, How To, How to Drive a Car, illinois, safe driving, Teaching Your Teen To Drive, Teenage Drivers, Teens To Drive, Teens with ADHD, Top Driver.